Usually it’s all about the football. But this week, Udinese’s owner said something that distracted from the football. He said he liked VAR because it took away the referee favors he believed Juve have been receiving. Which is a very uninformed, small-minded, but all too common misconception that is contradicted by actual facts. His words highlighted the zebra in the room and distracted from the fact that Udinese have to travel to the San Siro on Sunday to face a team who actually statistically has had advantages from time to time from referees. Plus face actual VAR, which so far doesn’t favor anyone. But that is what happens when you are seeing in black and white. Udinese defeated Genoa 1-0 last week in a match that saw both sides end on 10 men. For that match, Del Neri lined up Scuffet; Nuytinck, Danilo, Samir, Stryger Larsen, Barak, Behrami, Jankto, De Paul, Lasagna, and Maxi Lopez. Del Neri will be missing Pezzella to suspension and Widmer and Perica to injury. He gave a very interesting reason for one player who is in question though: “Nuytinck was out until Tuesday, stuck at home, on the toilet.” No VAR needed on that. Milan have had a roller coaster of emotions this week. After a heavy loss to Lazio on Sunday, we defeated Austria Wien 5-1 away in the Europa League. 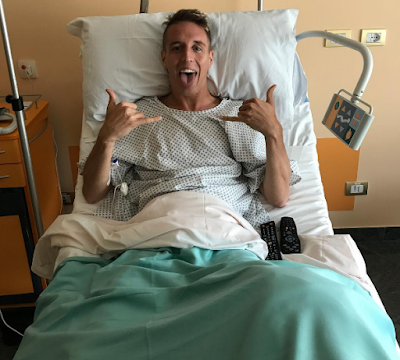 However that celebrating was cut short by the tragic announcement that Conti had ruptured his ACL and underwent surgery today. He will be out six months. This is a heavy blow to the team as he is such a talented young player. On the flip side, he is apparently the only player injured, so at least Montella will have almost a full squad. After such an emotional week, it’s difficult to know where Milan will be psychologically. I would hope that Conti’s serious injury will motivate them to win for him. But Udinese will be under the controversial words of their President, Pozzo. And both teams will be subject to VAR, and as we have seen, it is not partial. But if it takes away the long held beliefs of ref partiality, then I guess it’s good to see things in black and white.